Its all about hit-miss engines when you talk to Redd Stanberry, Bill Lanier and Donnie Gideon. What is a Hit-Miss-Engine and why are antique engines important to Buckeye? Redd Stanberry was born in a little ol’ town called Bovina which was the head quarters of the XIT or ten counties in Texas. The XIT Ranch was a super big rail head at one time. When the rail head moved from Kansas City, the next stop was Bovina, population 1,404 and one REDD. “I had the run of the place.” said Redd. 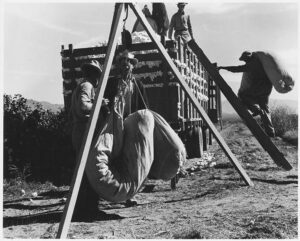 Redd moved to Buckeye in 1964 and later started Arizona Gin Supply in 1973. From a little town like Buckeye, we build gins in Africa and China. “We tear’m down and re-build gins, put them in containers, send them to Long Beach and they get shipped all over the world” explained Redd. Donnie Gideon was mentioned in the previous segment. 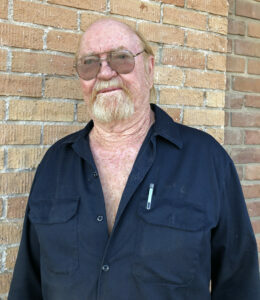 Bill Lanier Jr. is originally from North Carolina and moved to unincorporated Maricopa County near Buckeye in the late 1970’s. Bill’s family lives and works along Citrus and Perryville where they operate a 2 and a half acre Dragonflye Farms raising miniature livestock. Bill has a total of 17 antique engines. In between working on the farm, Bill gives Redd and Donnie a hand. Most engines were built between 1900-1925. People started getting electricity in the late 20’s and most rope pull 2 and 3 cylinder motors just went to the wayside. “Anytime we can save an antique engine now, it is like saving a piece of the past”, said Redd. The rural areas were the last to get electricity, farmers would belt up an engine to run whatever piece of equipment they needed to run, like corn grinder, water pump or a generator. Back in the day, you had one or two engines that would run everything via the belts. Today, everything has its own engine, from a weed eater to a chain saw. In the early 20’s, the tractors came out with a clutch pulley on the side of it. When the farmers got through farming at the end of the day, they could pull it up, put the belt on the clutch pulley and have a portable engine. Redd Stanberry at Cafe 25:35 Buckeye, Arizona. Why is this Engine Show important? “To show people what really happened in the past, we want to show people how we got to where we are now. There are lots of things we wouldn’t have today if we didn’t have those engines.”, replied Redd. Donnie added that television and social media have distorted history so much that kids have no idea what real history is anymore. Tom Trainer of Arizona Early Days Gas Engine & Tractor Association has been instrumental in organizing all the antique engine collectors to participate in the upcoming October 13th, 2018 Engine Show in Buckeye.